Gebs Lifecycle Reporting Connector provides access to the User Specification Library from the Web Publisher Server directly in Rational Team Concert so that you can load and publish reports while developing your applications. 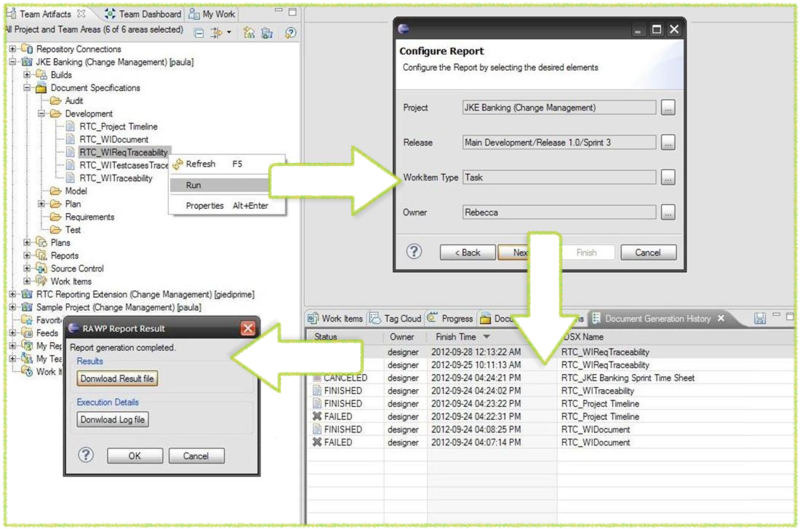 The Connector contributes in the Eclipse Client to the Project Area Domain creating a new child entry for Document Specifications. The connection to Jazz Team Server provides information to configure the document specifications together with trace ability reporting capabilities over the all CLM (Collaborative Lifecycle Management) resources: work items, test cases and requirements. The Gebs Lifecycle Reporting Connector contributes to each Project Domain that is loaded to Team Area View with a child entry. The entry will have a tree structure being filled with the data from User’s Document Specification Library of GEBS Reporting Web Publisher. In order for the tree to be populated with data, the GEBS Reporting Web Publisher Server has to be running and the log-in credentials provided in the preference page have to be correct. The publishing wizard starts on Run Action or on Double Click Action applied to a document specification. It is associated with the document specification artifact and is used to configure and execute the selected specification. The attributes that can be configured directly from the wizard are: project name, release name, owner and work item type. Only the project name must be configured in order for the report to be generated. The rest of the attributes are optional. With the report history feature users can store all the versions of a document over time. Document generation history balances Web-based reporting with the need to maintain past corporate documents for future reference. Document generation details (execution time, user, status, comments, etc. ), as well as the associated log and the result output files (archived in a .zip file) are all stored in the plugin’s preference store.